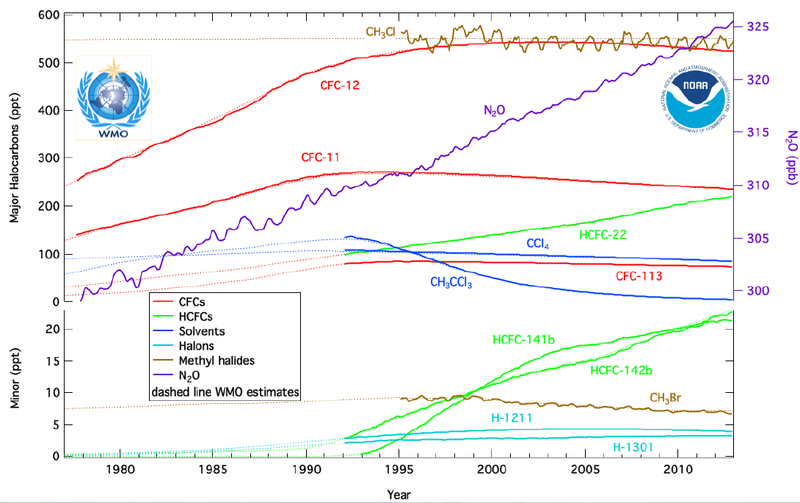 CFCs and their substitutes in stratospheric ozone depletion. Chlorofluorocarbons (CFCs) are nontoxic, nonflammable chemicals containing atoms of carbon, chlorine, and fluorine. They are used in aerosol sprays, blowing agents for foams and packing materials, as solvents, and as refrigerants. CFCs are classified as halocarbons, a class of compounds that contain atoms of carbon and halogen atoms. NOAA monitors atmospheric concentrations these chemicals and other important halocarbons at twelve sampling sites using either continuous instruments or discrete flask samples (below). Refrigerators in the late 1800s and early 1900s used the toxic gases, ammonia (NH3), methyl chloride (CH3Cl), or sulfur dioxide (SO2), as refrigerants. After a series of fatal accidents in the 1920s when methyl chloride leaked out of refrigerators, a search for a less toxic replacement began as a collaborative effort of three American corporations- Frigidaire, General Motors, and Du Pont. CFCs were first synthesized in 1928 by Thomas Midgley, Jr. of General Motors as safer chemicals for refrigerators used in large commercial applications. In 1932 the Carrier Engineering Corporation used FreonTM-11 (CFC-11) in the world’s first self-contained home airconditioning unit, called the "Atmospheric Cabinet". During the late 1950s and early 1960s the CFCs made possible an inexpensive solution for air conditioning in many automobiles (CFC-12), homes, and office buildings. Later, the growth in CFC use took off worldwide with peak, annual sales of about a billion dollars (U.S.) and more than one million metric tons of CFCs produced. CFCs can destroy stratospheric ozone. Whereas CFCs are safe to use in most applications and are inert in the lower atmosphere, they decompose in the upper atmosphere or stratosphere. In 1974, two University of California chemists, Professor F. Sherwood Rowland and Dr. Mario Molina, showed that CFCs could be a major source of inorganic chlorine in the stratosphere following their photolytic decomposition by ultra-violet (UV) radiation there. Some of the released chlorine would become active in destroying ozone in the stratosphere. Ozone is a trace gas located primarily in the stratosphere. Ozone absorbs harmful ultraviolet radiation in the wavelengths between 280 and 320 nm of the UV-B band, which can cause biological damage in plants and animals. A loss of stratospheric ozone results in more harmful UV-B radiation reaching the Earth's surface. In the 1980s a large springtime depletion of stratospheric ozone was observed and was getting worse each following year. This ozone loss was described in 1985 by British researcher Joe Farman and his colleagues. Others called it “the Ozone Hole”. The ozone hole was different than ozone loss in the midlatitudes. The loss was greater over the Antarctic than the midlatitudes because of many factors: the cold temperatures of the region, the dynamic isolation of this “hole”, and the synergistic reactions of chlorine and bromine. Ozone loss also is enhanced in Polar Regions as a result of reactions involving polar stratospheric clouds (PSCs) and in midlatitudes following volcanic eruptions. 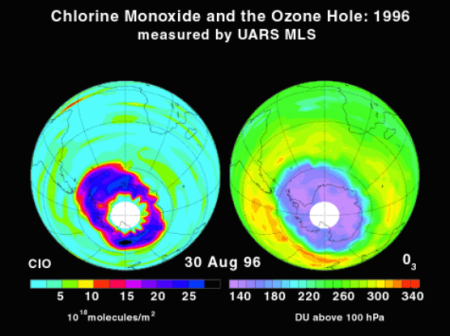 Large amounts of reactive stratospheric inorganic chlorine in the form of chlorine monoxide (ClO) were observed during this Antarctic “ozone hole” by the Microwave Limb Sounder (MLS) instrument onboard the UARS (Upper Atmospheric Research Satellite) over Antarctica in the austral spring (example from 1996 shown on the left). The need for controlling the CFCs became urgent. On September 16, 1987, 27 nations signed a global environmental treaty, the Montreal Protocol to Reduce Substances that Deplete the Ozone Layer that had a provision to reduce production levels of these compounds by 50% relative to 1986 before the year 2000. This international agreement included restrictions on production of CFC-11, -12, -113, -114, -115, and the Halons (chemicals used as a fire extinguishing agents). An amendment approved in London in 1990 was more forceful and called for the elimination of CFC production by the year 2000. The chlorinated solvents, methyl chloroform (CH3CCl3), and carbon tetrachloride (CCl4) were added to the London Amendment as controlled substances in 1992. Subsequent amendments added methyl bromide (with exemptions for specific uses), hydrobromofluorocarbons, and bromochloromethane. Besides recycling, the demand for CFCs has been further reduced by the use of substitutes. Some applications, for example degreasing of metals and cleaning solvents for circuit boards, which once used CFCs now use halocarbon-free fluids, water (sometimes as steam), and diluted citric acids. Industry developed two classes of halocarbon substitutes for other uses: the hydrochlorofluorocarbons (HCFCs) and the hydrofluorocarbons (HFCs). The HCFCs include hydrogen atoms in addition to chlorine, fluorine, and carbon atoms. The advantage of using HCFCs is that the hydrogen reacts with tropospheric hydroxyl (OH), resulting in a shorter atmospheric lifetime. HCFC-22 (CHClF2) has an atmospheric lifetime of about 12 years compared to 100 years for CFC-12 and has been used in low-demand home air-conditioning and some refrigeration applications since 1975. However, HCFCs still contain chlorine, so they destroy stratospheric ozone. The Montreal Protocol calls for their consumption to be eliminated by the year 2030 by non-article 5 nations (developed countries) and article-5 nations by 2040. The HFCs are considered one of the best substitutes for reducing stratospheric ozone loss because of their short lifetime and lack of chlorine and bromine, but they are efficient greenhouse gases and were targeted for emission reductions in the Kyoto Protocol. In the United States, HFC-134a (CF3CH2F) has been used in all new domestic automobile air conditioners since 1993. For example, global concentrations of HFC-134a are growing rapidly in 2013 at a rate of about 5 ppt/year; its atmospheric lifetime is 13.4 years. The Future: Recovery of the Ozone Hole and Nitrous Oxide (N2O). Scientists hope that stratosphere ozone will continue on its track to recovery, but natural and manmade changes can influence the year-to-year variability of stratosphere ozone concentrations. Atmospheric N2O is the third strongest greenhouse gas. It also is an ozone-depleting gas, because it forms nitric oxide (NO) during its destruction in the stratosphere. Human-caused N2O emissions are currently the most significant remaining threat to future ozone levels because the Montreal Protocol has been so successful in reducing emissions of halogenated gases like CFCs. Emissions of N2O from NO production are expected to remain the largest threat to ozone throughout the 21st century. Exemptions for specific uses, like those allotted for methyl bromide, have been introduced in the Montreal Protocol; so monitoring these halocarbons and N2O are still an important process towards monitoring the recovery of the stratospheric ozone layer to pre “Ozone Hole” levels, which is expected to occur between 2040 and 2080.